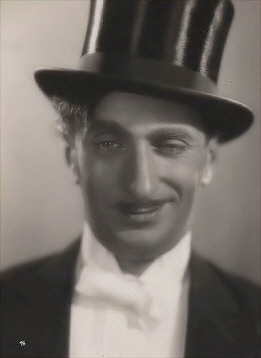 The actor Felix Bressart was born as Sally Breslau. He had his first engagement at theater in 1915 and like all great actors in those days he finally went to Max Reinhardt. He became a popular and successful comedian very fast. Since 1928 he turned up regular in films especially in comedies and military oldies which had a boom at the beginning of the 30s and became very popular because of Bressart. In his life Bressart was exactly what he impersonated in film: a shy, reserved and something clumsy human being. His clumsiness in his life and perhaps in his films were surrounded of a special tragedy. But the public found him funny - it didn't laugh so much at what happened to Felix Bressart on the screen than that it laughed at him with the roughness of children who find it funny when human beings are stuttering. The first movie in which Felix Bressart acted as a clumsy soldier was "Drei Tage Mittelarrest" (30). It was a funny but also a bad movie. Later the movie was imposed with a prohibition, not in Germany but in the USA. To his well-known movies of the 30's belong "Der Sohn der weisen Berge" (30), "Die Drei von der Tankstelle" (30), "Nie wieder Liebe" (31) and "Ball im Savoy" (35). As a Jew Felix Bressart had to emigrate from Germany in 1933. In 1938 he reached the USA where he soon became offered film roles. In contrast to other emigrated colleagues his roles contained artistic demanding. Many movies in which he took part rank among well-known pictures, e.g. "Ninotchka" (39) "To Be or Not to Be" (42) and "The Seventh Cross" (44). To bridge the lean time till he was able to gain a foothold in the US film industry he was busy as a nonmedical practitioner with his own practice in Beverly Hills. At the age of 57, five days after his birthday, Felix Bressart died of leukemia in Hollywood.